What features are essential in selecting operating room lights for multi-use surgical theatres? Most operating rooms outside of major research facilities and hospitals will be used for a variety of different procedures. This means that lighting in the room must be flexible and practical based on the individual procedural needs. Overhead operating room lights that are either single or double mount will provide outstanding value since they can be positioned to focus the light right where it is needed. Most of the ceiling mount units will have full rotation on the lights as well as arms that can be extended several feet from the mount. With this range of mobility and extension the surgeon or staff is able to easily swing and move the lights as needed during the procedure. Autoclaving handles on the lights are an important feature in a busy surgical theatre. Autoclaving handles allow the full sterilization of the handle between each procedure for optimum contaminant reduction. Not all lights offer this feature so if autoclaving handles are not an option be sure to check the design of the handle fore easy manual cleaning and sterilization. Flat surfaces, seamless joining to the light itself and control functions on the handle that will not retain liquids in crevices around the controls are essential. Choosing the type of bulbs that the surgical lights will use is another factor to consider. Different lights offer different features. Some provide a true light while others provide more of a contrast for easy examination and identification of objects. Virtually all lights are designed to avoid directing any heat and some, especially LED lights, add no additional heat to the room at all. This can help in temperature control in the room and surgical staff and patient comfort. Are there smaller operating room lights available that are a good option for procedures competed in patient examination and treatment rooms? Not all surgical procedures occur in operating rooms. Many doctors in specialized and general practices use operating room lights in their patient examination rooms. Dentists also use operating style lights to pinpoint bright and true light when completing dental procedures. 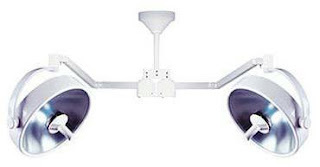 Single ceiling mount operating room lights are a good option for many uses. These lights can be positioned to provide a wide or narrow beam of light where required. Since they are ceiling mounted they are very space saving and easily pushed up and out of the way when not required. An even more flexible option is a gooseneck lamp that can be mounted to a table or to the wall. These types of lamps can provide a direct focused light perfect for detailed examinations. Headlights can also be used that allow a LED light to be adjusted to pinpoint accuracy. 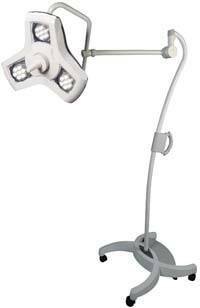 Worn around the head with an adjustable band this light source is highly mobile and easy to transfer with the physician from room to room. How are shadow issues dealt with through specific design features of different types of surgical lights? A key element in the design of effective operating room lights is the ability to position and rotate the lights to avoid any shadows. This means that the light has to be angled or designed to prevent the shadow of the surgeon and staff to create dark areas. To minimize this problem multiple lamps are found in each light, which provide different angels of illumination. The more lamps within each light the less chance of shadows. Other surgical lights may be designed with multiple reflectors behind the lamps. This decreases the need for large numbers of bulbs, helping to keep energy use low. The reflectors are angled within the design to focus the light to a central area from multiple points beside and behind the bulb itself. Even if there is some movement across the directed light from the bulb the light from the reflectors will prevent any shadows.